Good morning to those of you who arrived wherever you are! We are headed headlong into the doldrums that always come along the Texas fly fishing timeline — usually later, but apparently sooner this year. The extraordinary weather in North Texas has us all second guessing – second guessing everything. Nighttime temperatures in the mid and upper 60’s, and daytime highs in the low 90’s? Crazy. Drought all around and no end in sight – crazy. Zebra mussels – crazy. Bow hunters killing simple carp – crazy. Nobody seems to have a real clear idea of the voodoo that has a grip on North Texas, but make no mistake – it’s a crazy time. The Tailwaters party last Saturday was one for the record books. Tailwaters threw a party the way parties are supposed to be thrown – and the crowd responded. 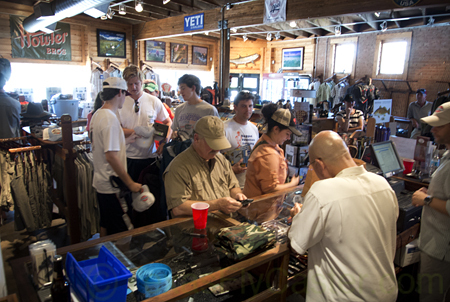 The register line was at least five deep most of the afternoon, and the tent was buzzing with fly fishermen and women talking fish, gear, travel and life. 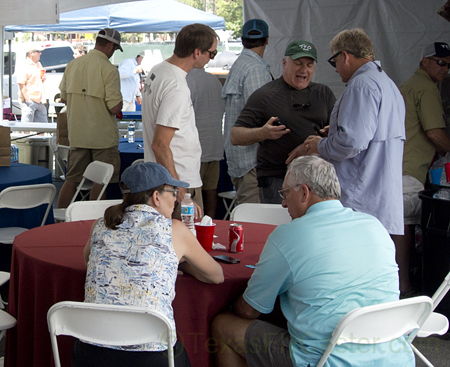 It was great to meet new people and touch base with so many others who have come to trust this site for information about fly fishing in North Texas, and Texas in general. Thank you for your personal comments, suggestions and tips – in person at the party. Behind the scenes, the buzz is getting a little lot louder locally for, of all places – Broken Bow, Oklahoma. The stories were so thick … I have no choice now but to “trust but verify” by making a run there sooner rather than later. The Beaver’s Bend Broken Bow fly fishing arena is one that will be on the calendar of places for the Fly Shack (aka. Airstream) to make a seasonal stop this winter, or early spring at the latest. As if fly fishing in Oklahoma weren’t enough, why not burn even more gas running for the coast? Yeah, it just seems like nothing any good is close anymore doesn’t it? Maybe good is close, but great is further away? Whatever your measure, the vise is constantly busy now – getting flies wound and bound for the Port O’Connor fly fishing trip in September. The entire prospect is complicated, but I should be able to do a couple of days with CK in deep water, prospecting for jack crevalle, as well as anything else that comes along, toward the end of September. The ingredients and types of flies for targeting jack crevalle that run in Texas saltwater are the subject of several upcoming posts. if you’re into tying flies, and into the new wave of flies being created with new technology like Clear Cure Goo, stay tuned. Most of my fly boxes are just about worn out too, so we will dig back into the synapses and do a post on making your own (better than Cliff’s) fly boxes. It is a complete reveal, and you will have all the information you need to make your own boxes. I used to sell them on my site, but am using the remaining inventory to replace my aging boxes! Let me know right away if you want to purchase one, and I will hold back on putting them into service. Later today, I will have a great new recipe out in a post – Mexican Street Corn on the Cob. If you are a fan of corn on the cob, and wondering how you can tie it into your time on the grill, this recipe is for you! The flavor is fantastic, and put this with fajitas or redfish on the half shell, and you will be passing this recipe along as well. While the trip to Florida was an eye opener, nothing of substance has come of the “deal” I was looking to do with the Mitzi, and I will be looking at other options for the 2014 season. Things happen for a reason, and I will figure this reasoning out eventually. If you are a regular reader, you know we get diverted all the time. I try and finish what I start, but there are loose ends out there that are so old they barely make any sense to tie off. It could be the last day in Asheville, North Carolina, earlier this year, or any number of other things. If you want to hear the final chapter of anything, now’s the time to speak, or forever hold your peace. I knew somebody would call me on that! Hard to forget Asheville, but I may have … it’s a multi-media post, so let me start digging. Thanks Tohner. More info on Asheville would be great!